Brandon Curry talks about Big Ramy’s decision to Leave Oxygen gym. 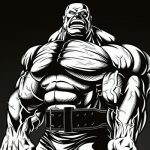 In an interview with Muscular Development, Brandon Curry was asked about his thoughts on Big Ramy’s departure from Oxygen Gym…“ it’s kind of weird not seeing him in the gym,” Curry said. Big Ramy left Oxygen in 2018 and it was big news. The reason was likely due to his 6th place finish at the 2018 Olympia which he apologized to his fans for. He placed 2nd just behind Phil Heath at the 2017 Mr. Olympia contest and since then, his conditioning fell off significantly. So his reasoning for leaving Oxygen was probably justified and now he’s trying to make up for his poor showing by transforming his physique with the help of Neil “Yoda” Hill. “It is different for us”… for me anyway that he’s not around. I wish him the best in what he’s doing,” Curry said. He wishes Ramy all the best in his career and respects that he is a grown man. After all, Ramy has to look out for his own best interest. “He has to do what he has to do… he’s a man,” Curry responded when asked how others felt about Ramy leaving. Will Big Ramy come back to the Olympia with a vengeance? He made some costly mistakes last year but it’s very unlikely this year will look the same.